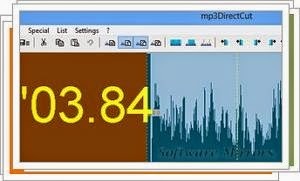 mp3DirectCut is a small application that can open and cut a certain part of MP3 file. It is not only support for MP3 file, it is also can be use for MP2 and CUE files. Besides cutting, you can also adjust the volume or even copy part of song to another file. mp3DirectCut is very useful when it comes to mixing audio file or to creates a ringtone for your mobile phone. It comes with a clear interface that let you mark the start and the end points, or you can use the navigation box. In short, with mp3DirectCut files you can cut MP3 files, adjust the volume level, and mix audio files easily. It is a very simple tools to edit your MP3 audio files.